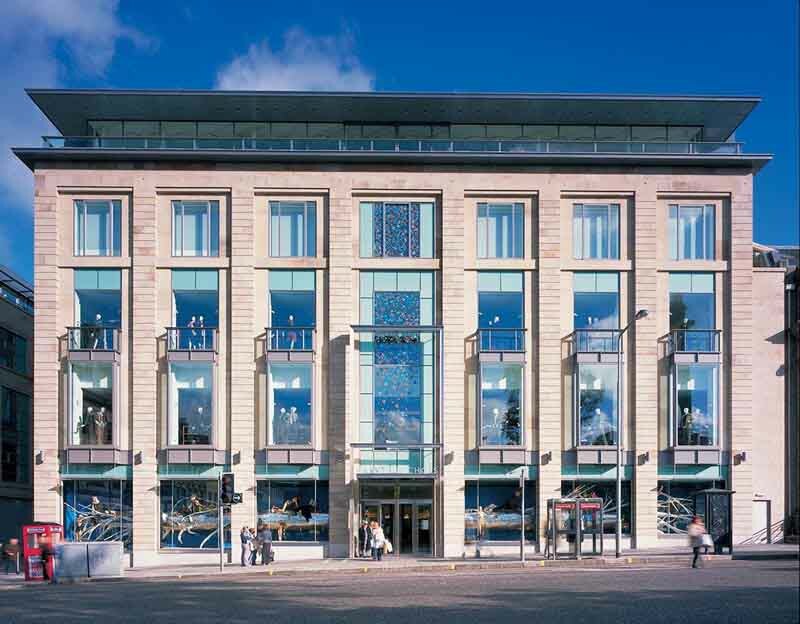 Harvey Nichols Edinburgh is a 90,000sqft, £11m department store. 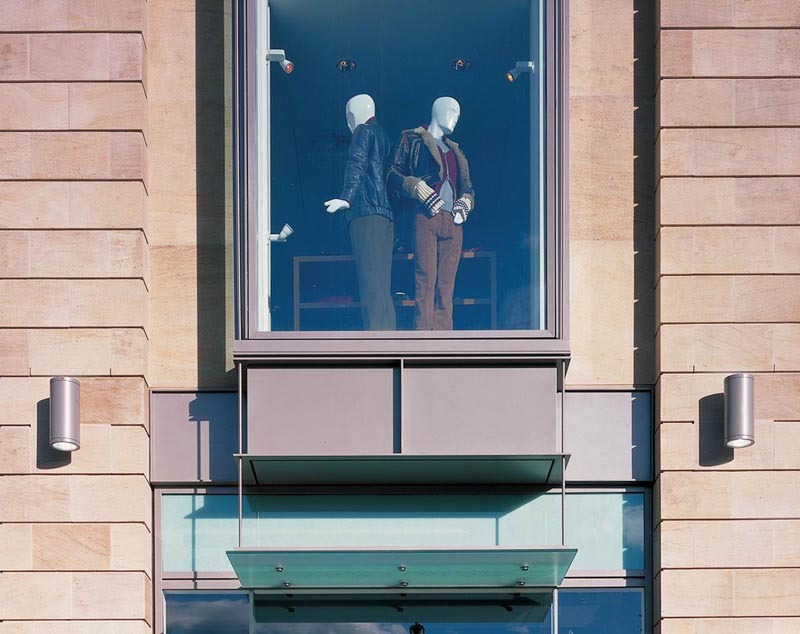 This luxury store stocks Yves Saint Laurent rive gauche – in Scotland for the first time – Prada, Gucci, 7, Dior, Comme des Garçons and Homme. ‘Harvey Nix’ foodmarket includes a charcuterie, patisserie and wine shop. Previously the closest Harvey Nichols store was in Leeds. 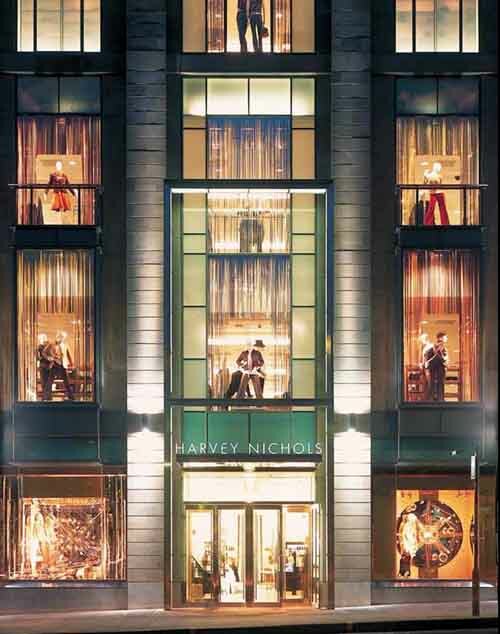 Harvey Nichols began in 1813 when Benjamin Harvey opened a linen shop in Knightsbridge, London. 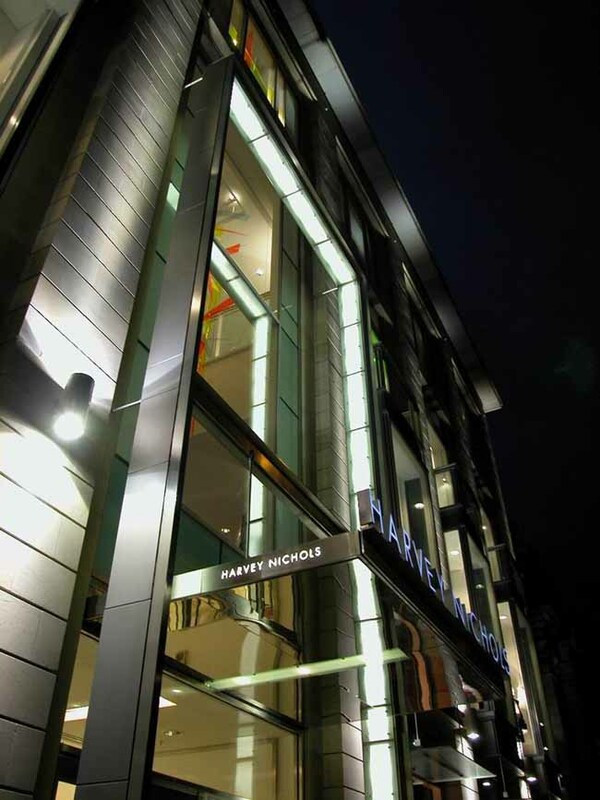 In 1820 the business passed on to Benjamin’s daughter on the understanding that she went into partnership with a Colonel Nichols, hence Harvey Nichols. The London store was opened in the 1880s. Debenhams purchased it in 1919 and in 1985 became part of the Burton Group, before being sold again. 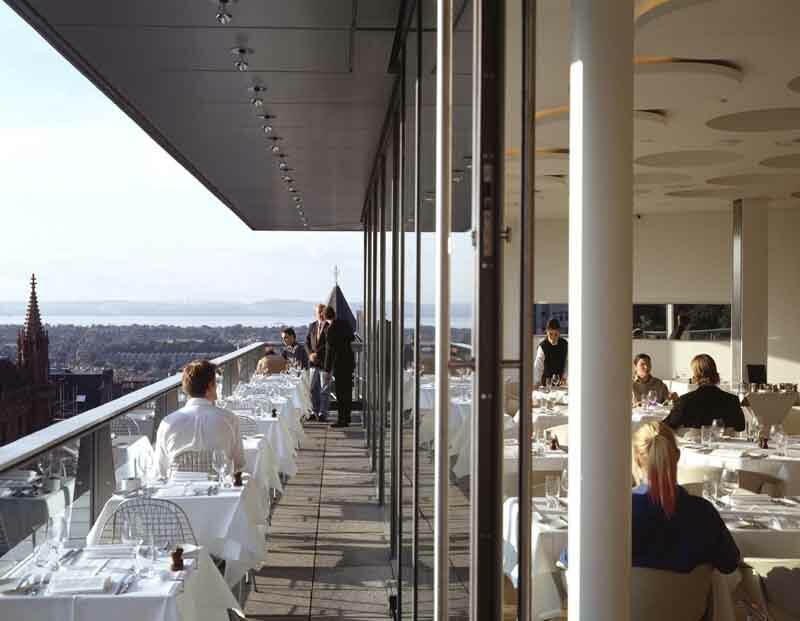 In 1996, the Harvey Nichols Group launched the Oxo Tower Restaurant on London’s South Bank. 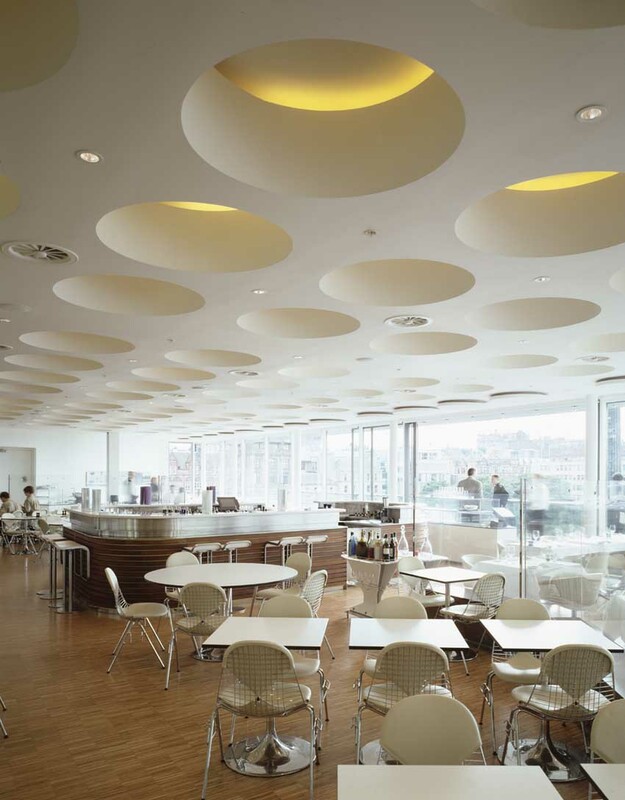 Fifth Floor at Harvey Nichols in London was the inspiration and was developed in 1992: the first proper restaurant to be situated within a department store. 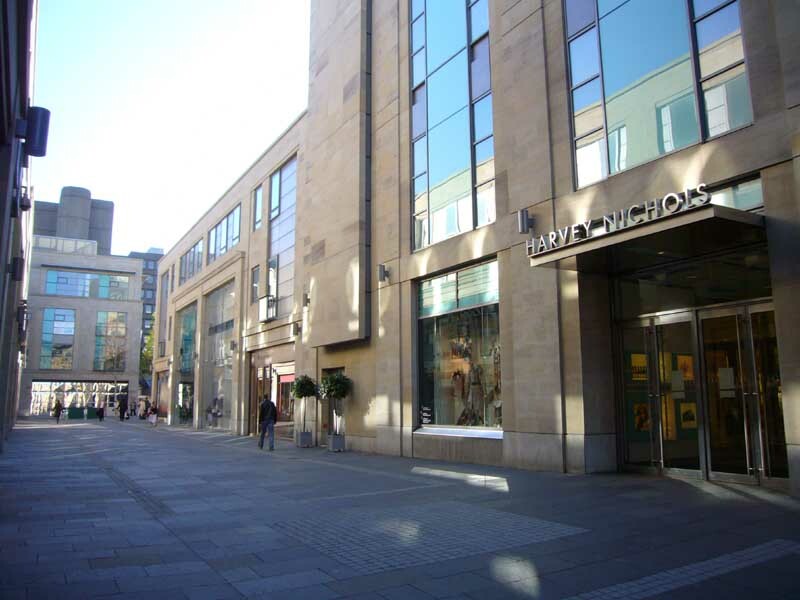 The Harvey Nichols project entailed the redevelopment of Edinburgh’s St Andrew Square Bus Station site replacing the 1960/70s office blocks and bus station with a new open pedestrian street – Multrees Walk – linking the St James Centre to St Andrew Square and George Street. A covered bus station containing 18 operational and 5 layover stances with airport style internal public facilities is included in the scheme, just to the north of Harvey Nichols and Multrees Walk. 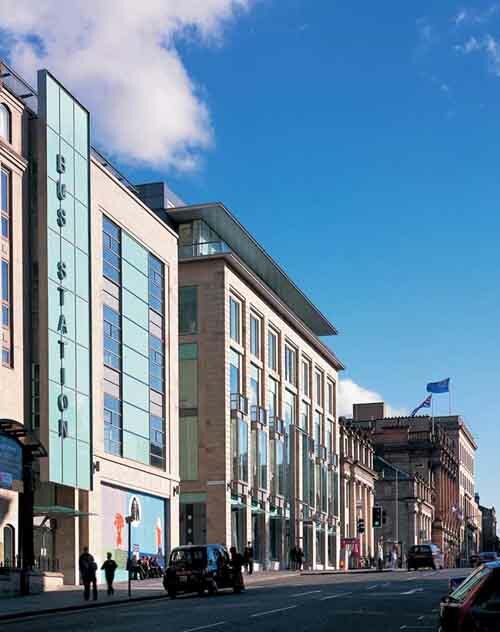 The retail development above the bus station focuses on Multrees Walk, the first new street in Edinburgh’s New Town since the late 18th century. 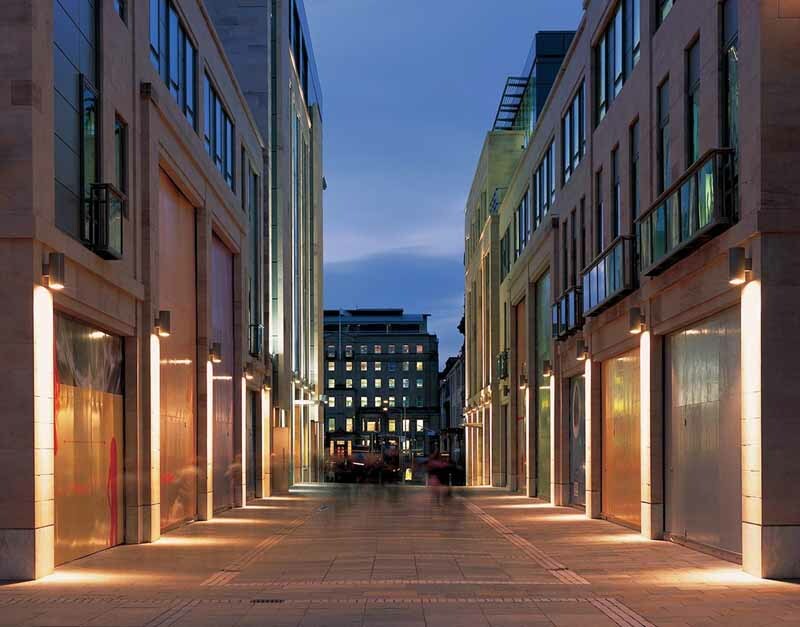 The Walk provides a high quality pedestrian urban environment and replaces the previous tortuous pedestrian route through the vehicular environment of the old bus station. 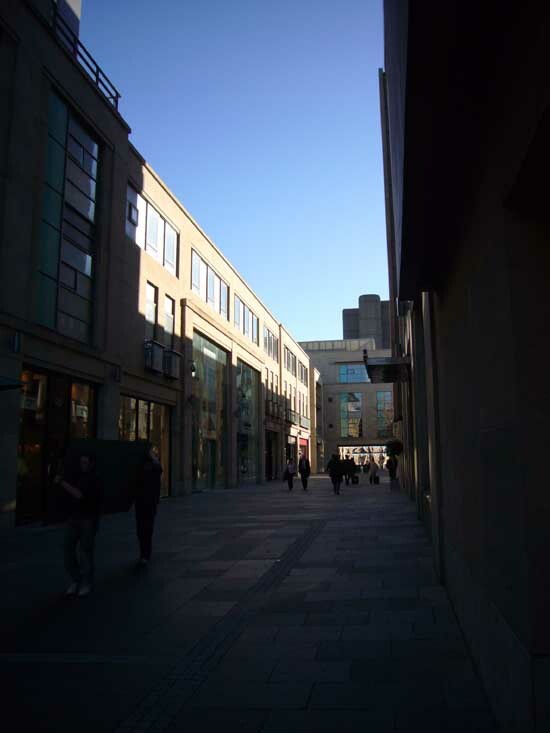 The design of the street is based on research and analysis by CDA of street widths and building sizes in central Edinburgh to achieve the right proportions and rhythms for the site located, as it is, in Edinburgh’s historic New Town Conservation Area and World Heritage Site. A ‘court’ is positioned halfway along the street to form a focal point for the new shopping experience, a café with outdoor seating may be located in the court. 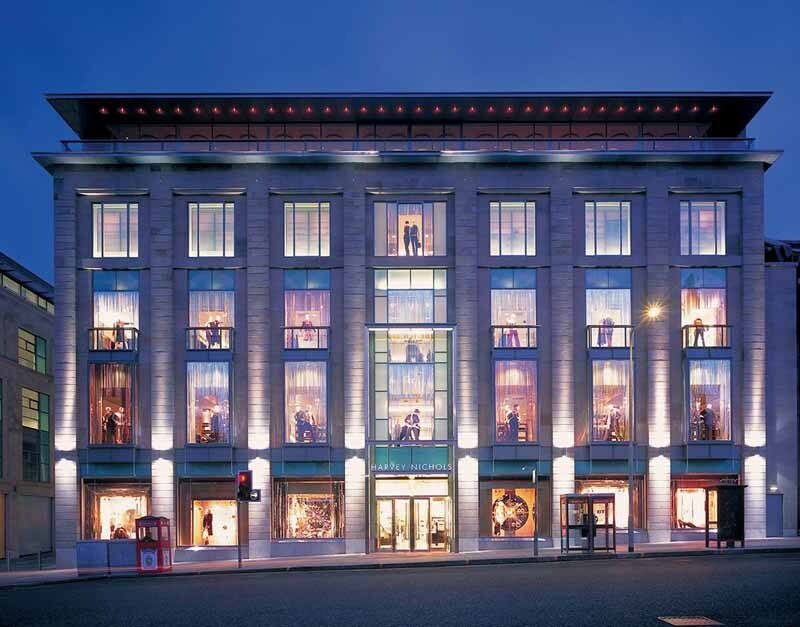 Edinburgh’s new Harvey Nichols sits at the corner of the Walk and St Andrew Square with the new Louis Vuitton store opposite. 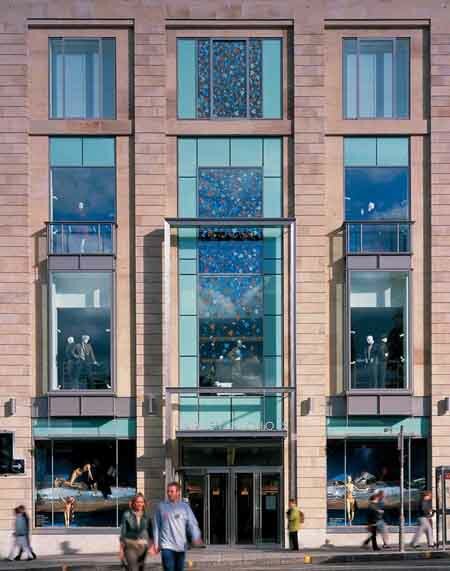 A further 26 shop units front onto the Walk and its courtyard including an Armani store. These are currently being marketed to high quality retailers. Above the shops is a 40,000ft² suite of offices. Multrees Walk is surfaced with Caithness stone and Granite setts. 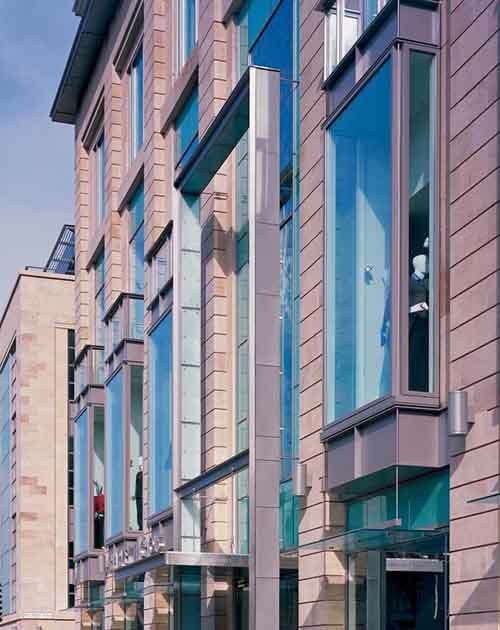 The buildings in the new street are designed and finished to reflect the quality and ambience of Edinburgh’s New Town with the facades finished in sandstone, granite and natural slate. CDA’s design of the new buildings and their details is modern and restrained. 2002 on budget at a construction cost of £32m. 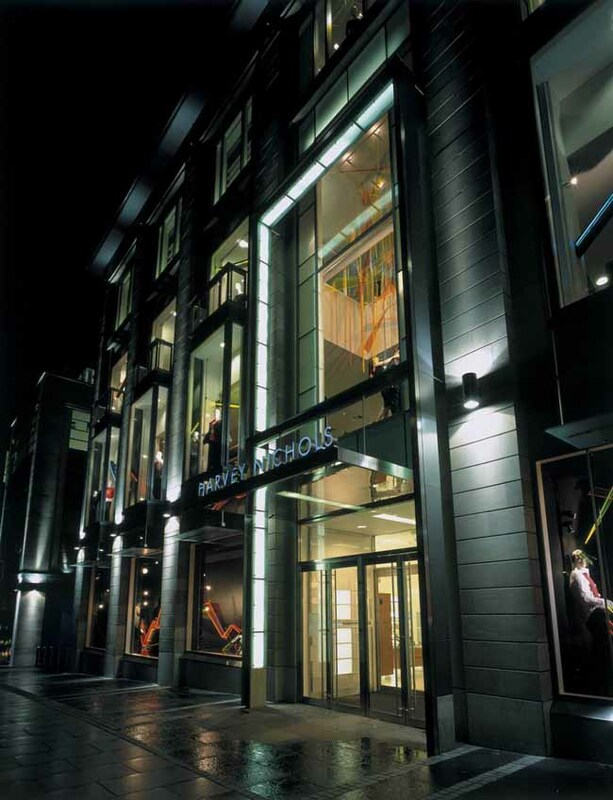 Harvey Nichols also have a Store in Al Faisaliah Mall, Olaya, Riyadh 11351, Saudi Arabia. Contact details correct at time of writing, Oct 2004.